David Hernandez is the Orioles fifth starter. David had a great spring leading the Orioles staff with 20 strike outs and a masterful game against the Sox seemed to seal the deal. Chris Tillman will be reassigned to AAA Norfolk. The Orioles want Tillman to develop his cutter more. Orioles.com blogger Britt Ghiroli tweeted Orioles.com Tillman said that the outcome would have been "totally different," if he had stuck with his regular pitches. Solidifying a cutter would make Tillman just that much more dangerous in the Majors, but Tillman does need to work on his control in general. I don't see Tillman being in AAA long, I expect him to be back in a Baltimore uniform by the summer or the second someone starts to struggle. Congratulations to David Hernandez, he pitched very well and completely earned this chance. April 6th is approaching, it is getting closer are you excited yet? I know that I am. The Yankees won tonight in a game that was played in either a wind-tunnel or a land besieged by a small hurricane. It was windy tonight folks. Adam Jones hit a ball that hasn't landed yet, Luke Scott smacked one as well. The only problem was that Robinson Cano, Marcus Thames and one more Yankee all took advantage of questionable O's pitching - and gales that were strong enough to repel a Athenian Fleet. The big question: How was Guthrie? Well - um - yeah - see - about that. Guthrie looked awful to start the game. He walked a bunch of Yankees, gave up a three-run homer to Cano, drilled Texeira in the elbow with the bases loaded but he struck out seven and aside from those things he did alright. His pitches had good movement, his velocity was up and there were certainly flashes of the Guthrie we all love and hoped would return in 2010. So, once again, Guthrie is maddeningly inconsistent. What does that mean in regards to the rotation? Probably not too much. The people that make the decisions all have faith that the Guthrie of old will emerge from his cocoon of mediocrity any day now. And there certainly were, as I said, flashes of brilliance tonight. Seeing Guthrie throwing in the 90's again with good movement was certainly a very welcome sight. Despite a bad pitch to Cano, and drilling Tex with the bases-loaded Guthrie was serviceable tonight. Jeremey's pitch count was ridiculously high again and he was again unable to get out of the sixth inning. It would do one well to remember that if this were a regular season game he would not have been pulled with 85 pitches in 5.2 IP. By that point in the game Jeremey had really calmed down and was pitching well, if this were a regular season game Guthrie probably could have made it into/ through the seventh easily. We should all know who gets the fifth spot in the rotation very soon. All signs are pointing to Hernandez. I still think that Tillman makes much more sense in the long run, but I see the point and I can't really get my hackles up over it. I'm on Spring Break I can't get my hackles up over much anything this week. Opening Day is, mercifully, right around the corner and the Orioles roster is prety much set. Roberts is back at the top of the order; Reimold and Wieters are starting to hit; the bullpen fog is starting to clear; God is in his heaven and all is right with the world. But recently the fifth spot in the Orioles starting rotation has become a battleground. From pretty much the beginning of camp everyone pretty much assumed that the starting rotation would feature Chris Tillman in the fifth slot. Tillman, part of the now legendary Bedard deal, is a fantastic young pitcher with great upside. He has nothing left to prove in the minor leagues but still has a lot to learn at the ML level. Enter David Hernandez. Hernandez is three years older than the 21 year-old Tillman and made a name for himself in the Orioles' minor league system as a strike-out pitcher. Last year at AAA Norfolk Hernandez K'ed 79 batters in just over 57 innings, giving him a K/9 ratio over 12 - the reason that Hernandez got the call last summer. While in the majors the two pitchers had similar stats. Both put up ERAs just over 5.40, both struck out about 6 batters per nine innings; both had unimpressive SO/BB ratios. They both played like young, high-talent pitchers that mixed struggles with flashes of brilliance. It looks like MASN is expanding their game coverage with the addition of four Oriole legends - pitchers Mike Boddicker, Ben McDonald, outfielder Brady Anderson and first baseman/Hall of Famer, Eddie Murray. I'm intrigued to see Eddie Murray interact with the MASN gameday crew. Of course, everyone knows about Murray's so-called legendary aversion to the press, but I'm looking forward to hearing his perspective on the sport and his abilities now that he's on the other side of the proverbial fence. With Mike Flanagan back in the booth as well for the network, 2010 will have a fairly strong ex-Oriole presence on the broadcast side of things. This week, as part of the Hot Stove website, the Oriole Post along with other prominent bloggers were asked this question: With less than two weeks remaining until Opening Day, what do you feel is the biggest question facing the Orioles for 2010? Right now, aside from how the young pitching will fare, I think a lot of fans will be keeping their eye on second baseman Brian Roberts. He's a major cog in Baltimore's offense as it's leadoff hitter, and if Roberts is out for an extended period of time or is not ready to start the season, it will suffer. Roberts has been recovering from a herniated disk and flew up last week to Baltimore for treatment. Since then, he's taking part in workouts, swinging the bat and has been in Florida preparing for some game action later this week. From all indications, he looks and sounds fine -- right now. However, if Roberts' back issues flare up again or get worse, I'd imagine he would go the disabled list. If he does miss Opening Day or portions of the season, we might see Ty Wigginton, Robert Andino or perhaps someone like Justin Tuner play there for some time. Sadly, Baltimore's lineup isn't the same with those options available. Speaking of Brian, he's expected to play tonight in Sarasota against the Minnesota Twins. As we all know by now, Joe Mauer signed a contract extension with the Minnesota Twins. The eight-year $184 million deal makes Mauer the highest paid player not on the New York Yankees. Mauer has solidified that he is the face of the Twins for years to come, more over he will not be a Yankee, Angel or Sock. Joe Mauer, with the swipe of his pen, just saved baseball. The lament of the mid-market teams, especially the Orioles, Rays and Jays, for the last decade has been the spending habits of the leagues big-city clubs. You could lump them all together but the team that everyone really looks at is the New York Yankees. With a payroll just over $0.2 BILLION the Yankees spend $60 million more a year than their nearest salary competitor, the Mets. To put that in perspective, if you subtract $60 million from the Mets you go all the way down to the Colorado Rockies, number 20 on the salary scale. In baseball today, the difference between number 1 and number 2 is the same as the difference between 2 and 20. For the last decade the cry has been that the big-time New Yorks and Bostons of the world just have to sit and wait for the league to develop talent then swoop in with a blank check laced with bright lights and big promises. Essentially the rest of MLB was little more than the farm system for Boston, New York and LA. The Twins had suffered through this once before having to trade Johan Santana away for a rather paltry return, it was certainly no Erik Bedard deal. And this was the lot of the small to mid-market team. The prospect of having a small window of competition before your players get too expensive and then another five to six years of being a second class citizen. And in the AL East that is simply magnified beyond belief. This just came out this morning, courtesy of Ken Rosenthal from Fox Sports. It looks like that there will be a big shakeup in the front office. The news won't be formally announced until later on this week. The Orioles, shaking up their front office as Opening Day nears, are replacing farm director David Stockstill, according to major-league sources. Stockstill will move into another position, sources said. His brother, John, the team’s director of international scouting, will take over some of David's duties. Assistant farm director Tripp Norton and field coordinator Brian Graham will assume expanded roles. David Stockstill, 52, has been the Orioles’ farm director since Nov. 3, 2004 and a member of the organization since 1994. The Orioles will portray the change in a positive light, one source said, but club officials had grown increasingly frustrated with David Stockstill’s communication skills and approach to player development. Who Has Helped or Hurt Themselves the Most With Their Performances This Spring? This week, as part of the Hot Stove website, the Oriole Post along with other prominent bloggers were asked this question: Bearing in mind that Spring Training stats are essentially meaningless, who among the Orioles' players have helped or hurt themselves the most with their performances this spring? For the most part, the Orioles everyday batting lineup is set, and also the bench. Although second baseman Brian Roberts has not played in a Grapefruit League game, Felix Pie has not played much due to injury, and Miguel Tejada, Nolan Reimold, plus Matt Wieters are struggling at the plate, no one is in real danger of losing their jobs. On the pitching front, both Brian Matusz and Chris Tillman have made quite the impression this Spring; meanwhile, Brad Bergesen is coming back from injury and looks to be healthy. Veterans Kevin Millwood and Jeremy Guthrie have struggled at points during camp, but both men are virtual locks in the rotation. Farmhands such as Josh Bell, Rhyne Hughes, Brandon Snyder and Miguel Abreu have made a solid impression amongst fans and personnel with the organization who seem them every day. None of these guys will be up with the Orioles on Opening Day unless there's a major injury or until much, much later in the season. The real battle for roster spots is pretty much out of the bullpen at this point. Jim Johnson, Mike Gonzalez, Koji Uehera, plus lefties Will Ohman and Mark Hendrickson are locks; meanwhile, Cla Meredith, Matt Albers, Kam Mickolio and Dennis Sarfate are fighting for jobs in Baltimore. However, Mike Gonzalez has struggled with some ailments over the past week, but for the most part, he's more than safe on the roster. Also, young pitchers David Hernandez and Jason Berken are also in contention for a roster spot. Both men had ups and downs last season at the major league level; however, Hernandez has been the far more consistent and impressive of two, while Berken has struggled. Hernandez could find himself a fifth starter if Tillman falters or in the bullpen, while Berken - I think - will start the year in Triple-A (Norfolk). Here I sit, paying $5 for courthouse wireless in a fairly stuffy room on the second floor of the Clarence Mitchell Jr Courthouse in beautiful downtown Baltimore. At least I assume it is still a beautiful day outside, the few times they have let us out of our pen the sun has been shining and a gentle breeze blowing. But, why would anyone want to leave? Fifteen dollars and "Monster In-Law" on the TV?! The hell, you say! Sign me up! All kidding aside, Jury Duty is fairly mind numbing, but the facilities are nice and the building is pretty and I have the ability to sit and talk to you - my dear readers. First order of business; Jeremy Guthrie. Jeremy, Duder, seriously you are caring us up here. Every Orioles fan worth his salt is willing to chalk up last year to a "down" year. Even the best pitchers have them. But Guthrie's performance thus far in Sarasota has been let's say less than awe inspiring. Guts' ERA isn't quite as high as the clouds - but King Kong is swatting at it whilst atop the *new* Legg Mason Building. Guthrie had a sever problem with homeruns last year. Guthrie gave up a league leading 35 dingers in '09 on his way to a league leading 17 losses. No one more than Guthrie himself wants to put a disastrous 2009 behind him and start fresh. So far this Spring Guthrie looks like he is still trying to shake off the last vestiges of a bad dream. Guthrie has an ERA over nine and has given up three homers so far. Now, before you say it - yes I am well aware it is Spring Training. I am aware that these things mean nothing. but you are not going to sit there reading the words on your screen and tell me that Jeremy's rough start does not bother you just a little bit. You are not going to sit there and say that if Jeremey was mowing down every player he faced you wouldn't be completely jazzed. Admitting you have a problem is the first step to recovery. Hi, my name is James - and I am slightly concerned by Spring Training statistics. - The new color commentary supplied by former Orioles Brady Anderson, Eddie Murray, Mike Boddicker and Ben McDonald. During various games this year each player will fill the color seat vacated by Buck Martinez and I am looking forward to hearing it. - If Brian Roberts gets through tonight okay, he will get another start tomorrow. Tonight is big; if Brian can't go on the sixth this team will have problems early on. - This is a big game for Guthrie. Jeremey has had a very rough spring and tonight he is going up against a lineup that pretty much amounts to the Yankees' A-squad. If Guthrie struggles again his leash will be, or at least should be, very short for the start of the year. Guthrie simply needs to have a solid start tonight a good one will make all of us breathe a little easier coming into the final week. Tune in later tonight for a wrap-up. The 2010 baseball season will being in 20 days. 20 days, the weather is great here in the Land of Pleasant Living. 66+ degrees and a few wispy clouds in the sky. It smells like spring, I can taste baseball. Still, the Orioles have some issues to deal with. Second baseman Brian Roberts has yet to play in an exhibition game and has returned from his brief jaunt to Baltimore with yet another prognosis of wait and see. Roberts received an epidural to try and calm the small hernia in his lower back. Roberts is still planning on being in the lineup in 20 days, but the longer this goes on the more worried I get. To me, the silver lining in this situation is that if this was any kind surgery-worthy injury we would have known that by now and Roberts would have been presenting more troubling symptoms. All accounts are that he looks fine and is doing pretty much everything in camp - except playing in games. Even more troubling however is Nolan Reimold. Nolan is recovering from achilles surgery over the winter and it seems he is still running with soreness and limping.The young outfielder has been assuring everyone that he will be fine, but I am very concerned. Unlike Roberts, Reimold still has a lot to prove and I could see him trying to fight through an injury and making it worse. Combine this Felix's sore shoulder the outfield "log jam" is suddenly looking a lot less jammed. 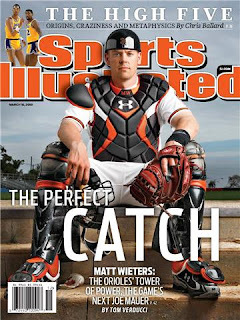 Another source of concern is recent SI cover-boy Matt Wieters. Wieters has only one hit so far this Spring. Now, granted he hasn't played on consecutive days much, and it is less than 20 ABs, and some might say that he is a slow starter, and he isn't playing in complete games, and he is supposed to be working on his defense moreso that his offense - but one hit. One. I am a full believer in Wieters, but here is the deal Baltimore. We have put the weight of the world on this young man's massive shoulders. Wieters was feeling the pressure last year and he scuffled, hopefully those butterflies will be gone but I am sure being reminded that his Georgia Tech teammates nicknamed him "God" doesn't help things. Once again, Spring Training is practice it doesn't count and there is no need to worry. CC Sabathia looks terrible as does Joba Chaimberlain the struggles of Wieters et al are more common than not and there is no reason to worry. But the Baltimore inside me is getting nervous. The blog has mentioned over and over that a key to how far the Orioles in 2010 and the future will hinge not solely on the offense, but the pitching. So far, while Kevin Millwood and Jeremy Guthrie have been working out the kinks in their repertoire to prepare for Opening Day, the real beacon of hope is coming from the arms of Brian Matusz, Chris Tillman and Brad Bergesen. Matusz, this spring as evidenced by his start against Philadelphia -- with their ‘A’ lineup – on Sunday looks more like a veteran on the mound than a youngster. Although some guy who will eventually be playing down the Baltimore-Washington Parkway – um, Stephen Strasburg – has gotten the lion’s share of the hype concerning prospects, the media should not overlook Matusz. He’ll be entering his first full year in the majors, and most expect big things from him. Obviously, it’s hard to say how Matusz will do this season; however, with a full season under his belt, and the potential he’s shown so far, it would not be impossible to think that he could win anywhere from 12 to 15 games. As for Tillman, he got knocked around a bit last season, but his first go-round in Baltimore was indeed a learning experience. He’s looked good so far in Spring Training, looking far more consistent with his pitches on the mound and getting guys out. For now, he’s the fifth starter if he doesn’t blow it. Tillman may be slightly behind when it comes to Matusz’s skill, but with his size, height and ability, there’s no reason to believe he cannot become a solid to better-than average major league pitcher. The same could be said about Bergesen, whose year ended due to injury. While Bergesen may not have the physical gifts of Matusz or Tillman, he’s got something that’s critical – smarts on the mound. It’s a little over three weeks before the 2010 season begins and Brian Roberts has still not played in an exhibition season game. I’d like to say that the fact Roberts’ has not seen any live action this spring may not be a big deal; however, it may be turning into one. Brian’s been recovering from a herniated disk, taking part in workouts and has been in Florida – but, now he’s flying back to Baltimore to see a back specialist at Johns Hopkins University. Everyone seems to be towing the company line and says Roberts should be ready for the season – at least for now. I’ve had back issues in my life, and I’m far from being a professional athlete, but as it is right now, I see Roberts perhaps being put on the disabled list to start the season. Roberts looks like he wants to undoubtedly play; however, he’s missed quite a bit of time so far and perhaps that the second baseman may just need more rest . If he does miss Opening Day, we might see Ty Wigginton, Robert Andino or perhaps someone like Justin Tuner play there for some time. However, the lineup -- especially at the top of the order -- will no doubt be impacted. I’d say even if Roberts does find himself ready to go this season, he will not play in every game and find himself out of the lineup sparingly as precaution (or unless his back heals). Orioles Spring Training got off to a great start, but the Orioles have struggled recently. Losing skids in ST are not usually something to worry about but still it would be nice to see the Orioles winning games. Players seem to be progressing well enough. As Anthony pointed out in his discussion of Josh Bell, the roster is largely set so all that really matters for this team is that everyone be healthy and at "game speed" by April. But even that has been a problem. Brian Roberts has yet to play in an exhibition game. Sidelined by a slight herniated disk in his back, and a bad reaction to medications for said back, Roberts' lack of playing time has led to a bit of consternation in Birdland. The official line from the head office and Roberts himself is that the veteran second baseman will be ready for Opening Day but every day that Roberts is not in a game is a day of lost preparation. And Opening Day is fast approaching. Now, Brian is a veteran who takes very good care of himself and he arguably does not need the reps that a younger player would require but I for one will not be comfortable until I see him in the field diving for grounders. He has been doing everything else that a regular player would be doing, but we need to see Roberts in a game. The Orioles have been losing recently, today's game against the Yankees had the same result. Jeremey Guthrie got hit around in the first inning today, as the Yankees batted around and collected three runs on their way to a 5-3 victory. We need to remember that these games are practice and pitchers are working on specific things, the fielders making errors aren't the players we will be seeing in April and the pitchers giving up late leads will not be traveling north to Baltimore in three weeks. However after awhile these platitudes begin to ring hollow as even the most jaded statistician of a fan wants to see their team in the win column. It was finally good to see Brad Bergesen back on the mound Wednesday night. Despite the young hurler being unsatisfied with his outing – where the Orioles won against the Pirates – it was a very good sign to see that he was not hurting at all. It looks like Brad’s knee and shoulder are fine; therefore, he’s rearing to go and forge ahead into the new season. With about a few more weeks to go before the Orioles play the Rays to start the 162 game regular season marathon, fans are hoping Bergesen can move on from his injury and get the Orioles closer to respectability. On the other hand, Millwood’s performance the following night was a little disturbing. While it is a bit early to be concerned with the veteran pitcher, two consecutive bad starts in Florida have raised a few eyebrows. Milwood gave up five runs in 2 2/3 innings on Thursday in a loss to the Twins and he’s not too worried with the result. Much like after his first start, his struggles may not be a big deal, but if it continues, I’d be tad concerned. Kevin’s got a track record as a veteran in the regular season and knows his body over the years, so let’s hope the struggles end up to be just talk than reality. This week, the Oriole Post along with several other prominent bloggers and writers were asked a question by the Hot Stove website about the Orioles. The question this week was centered around Josh Bell and if he’s going to make the Orioles’ 25-man roster out of camp in Florida. Matt Wieters is going to be the cover story for this week's issue of Sports Illustrated. According to the magazine, Wieters will be the first Oriole to grace the cover of Sports Illustrated in more then 13 years. The story was written by SI Senior Writer, Tom Verducci. The Orioles have had six straight losses in Spring Training, including an awful error-filled game in a loss to the Rays on Tuesday. Does it mean much, no. Players are simply trying to get their work in and get ready for the season; however, if you're a pitcher on the fringes, a backup guy trying to stay in the big leagues, or a minor leaguer trying to get a look from the organization - this time of year is important. Still it doesn't look good when the team has lost six straight in exhibition season. Then again, let's hope things get figured out with the Orioles before the season begins. Now, it also seems that Brian Roberts may not be ready for Opening Day according to reports. If that's true, it's a major blow to the Orioles. Most of us know that the second baseman has been out due to a back issue, but it seems like the medicine Roberts has been taking made him ill.
Roberts, who has a herniated disk in his back and then got sick as a result of the medication he was taking to ease the inflammation, hasn't played in a game all spring, and now he has been shut down until at least Thursday. "I talked to Richie Bancells, our head athletic trainer, about it again today, and at this time he still thinks Brian is going to be ready for Opening Day, but you have to be concerned now," MacPhail said. "To me, you get 10 days into spring training before you start really paying attention, but the clock is starting to be an issue. ... By now, we have to start thinking about, 'What if he isn't ready?' "
MacPhail said he might start having his scouts look at who is available on the trade market along with exploring internal options. Roberts started taking an oral medication Sunday and became ill. He reported to Ed Smith Stadium on Tuesday but spent much of the day in the training room. The two-time All-Star will be re-evaluated Thursday, but he's at least a week away from getting into a game. Not good. I'd say give Brian all the time he needs to get healthy at this point. He's one of the cornerstones with the franchise, and it's better if he were 100 percent later, than playing at 80 percent in the near future. Get them while they are hot. The early buzz for the shirts has been great and it is finally time to go live. I am now taking pre-orders for the first printing going out later this month. IMPORTANT! Only people who pre-order before 3/20 are guaranteed to receive their delivery before the Oriole's home opener on April 9th. Sizes S-XL $16.50 + $4.00 shipping; Size XXL $17.00 + $4.00 shipping. Printed on 100% cotton, Gildan Tees. It was ugly for Kevin Milwood yesterday. Ok, so Spring Training games don't matter, and the hurler may have truly just been working on his stuff, but he gave up six runs on seven hits -- in the opening inning against Detroit. The Orioles ended up losing 9-5 to the Tigers down in Florida yesterday and much of the talk from Saturday centered on Millwood's horrific first outing. He only lasted 2/3 of an inning, but gave up a homer to Clete Thomas and allowed a double, plus a multitude of singles. Millwood says he'll be fine, and based on his track record, his start was no big deal (if this happened in late March, it would be a different story). Matt Albers pitched 2 1/3 innings of solid relief. Brandon Erbe got shelled as he gave up three runs in the sixth inning. Ty Wigginton went 2-for-3 and homered off Detroit ace Justin Verlander in the second inning. The Orioles scored four times in the ninth, and two runs came courtesy of Rhyne Hughes' two-run homer. "He's like Cole Hamels, but with a better fastball. He's got a chance to be really special, with that stuff and command. Last spring, the pitcher I liked, as an up-and-comer, was Josh Johnson. Now, it's [Matusz]. If he's not the best young pitcher in the American League, I'd be shocked." Wow. Go Brian. Seriously, based on what I saw last year -- before he was shut down, plus his overall demeanor, makeup and how he's handled being in the majors, it would be a surprise if Brian was not successful. Barring injury or a major setback, he's not only a key to the rise of the Orioles in 2010, but the future. The Orioles may have lost last night to the Pirates, 5-3, in Spring Training action; however, Chris Tillman is indeed healthy and free of back issues. The hurler threw two perfect innings and struck out three -- a very good sign. The team has continued doing it the plate, as Adam Jones homered (a solo shot), plus both Robert Andino and Luke Scott drove in runs. Garrett Atkins was 2-for-2 with a double and triple. Pitcher Mike Gonzalez was shaky as he allowed a run on two hits in an inning of work. Alfredo Simon -- who's on the comeback trail -- took the loss as he gave up two runs in the top of ninth on the mound. Everyone is still raving on the work of third baseman Josh Bell, but he's more than likely still going to start the season in the minors. Miguel Tejada, who people were worried about playing the hot corner has looked fine so far and made a real nice play last night to assist Tillman. Luke Scott has always been sort of a quandary to me. The designated hitter/first baseman/left fielder for the past few season in Baltimore has been a player who must be the streakiest I've ever seen put on a uniform. Despite that, I do think he's a player who tries his best and for that he's a fan favorite. As evidenced by last year, Luke can carry a team on his own for extended periods of time with his bat, or can into a prolonged slump (much like what fans saw at the end of the season). There were rumors of him being mentioned in various deals, but none of them came into fruition. Of course, Scott's value isn't with his glove, but his bat. As it is, I'm not sure if he's a part of the future when it comes to Orioles; however, he's still very much a serviceable bat on the roster. Now, the issue is whether he can hit on a consistent basis. In the first half of the season, he looked like an All-Star, bopping 18 homers and hitting north of .300 at the break; therefore, if he can just maintain that ability six months of the season, he could help the Orioles immensely. Orioles Lose to Rays, UMD-Duke, Is Matt Wieters Ready to Lead? This afternoon, the Orioles again faced the Tampa Bay Rays -- this time on the road -- however, they ended the day with a 6-5 loss. Felix Pie, who has had rave reviews of his work in Florida, was 2-2 with a home run and triple before leaving the game with a minor injury. It looks as if he pulled his hamstring, but according to the Baltimore Sun's Pete Schmuck, he'll be fine. Brian Matusz, who started the game for Baltimore, went 1 1/3 innings and looked solid on the mound. He did run into trouble as he gave up a two-run homer to Sean Rodriguez. Overall, he was impressed with the job he did as he was on the mound facing competition this Spring. He struck out the first three hitters in the opening inning. Mark Hendrickson -- who came in the game in the 4th inning -- gave up two runs. Lefty Mike Hinckley for Baltimore took the loss after Matt Joyce's RBI-single won the game for Tampa. It's awesome to have real baseball back. The Maryland-Duke game was awesome last night and it was good to see the Terps get a win on Senior Night over a heated rival, despite the carnage that seemingly took place in College Park after the action stopped on the court. Celebrating and showing passion for your team is nice, but it really behooves me -- STILL -- how people (alcohol-induced on not) think they have the right to act boorish, vandalize/destroy property and give their school a bad name. Just unreal. This week, the Oriole Post along with several other prominent bloggers and writers were asked a question by the Hot Stove website about the Orioles. We were asked simply if catcher Matt Wieters was ready to step up become a leader for the team in 2010. But first - swag anyone? Ladies and gentlemen, my name is James Baker. Five years ago I started a venture that brought me to the world of blogging and the Orioles internet community. Five years ago I started The Flock. It got me a little press and I sold roughly 250 shirts. Life was good, but the Orioles were not. The buzz faded, I bounced around the internet. I became a teacher, moved to Baltimore and life went on. From time to time I would see one of my shirts around town, it would make me smile. From time to time I would wear one and usually people would immediately ask me: "Hey where did you get that?" And I would have to tell the whole story again. The next question would inevitably be: "Will you make them again?" And that is something I pondered for awhile. I have almost done it a couple times since but it never felt like it was the right time. So, internet - I ask you this question: Is it time? 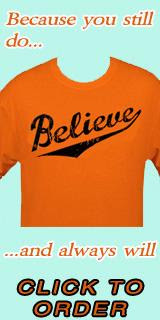 Tell me Orioles fans: Could you see yourself in something that looks a little like this? The Orioles had a heck of a start to the exhibition season with a 12-2 whomping of the Rays. Top prospect Josh Bell hit two homeruns, one from each side of the plate; Nick Markakis hit a homer, firstbase prospect Rhyne Hughes hit two; third base prospect Scott Moore hit one as well. The Orioles pitchers had a great day, Jeremy Guthrie was in top form and the only hiccups came with Safarte and Hernandez each giving up a run. Miggy had his first game at third and it was a mixed bag. Tejada had an error on a ball that skirted under his glove as he attempted to catch the short hop. He made the first play that came to him however and he has plenty of time to get into gear at third. It's great to see that the exhibition season is finally under way. The Orioles played an intrasquad game on Monday, but the real action is finally getting under way. The Orioles kick off Grapefruit League action in Sarasota on Wednesday afternoon against the Rays, and it's needless to say, everyone is glad to truly be playing live baseball. Manager Dave Trembley wants to get a good look at everyone and his starters will be the game for five innings, until the subs come in. Pitcher Jeremy Guthrie will start the action on the mound. It also looks like Brian Roberts is on the mend, and is ramping up his batting practice sessions; therefore, from the looks of things, he should be fine in the weeks and days ahead. On the pitching front, Brad Bergesen is also looking impressive in his bullpen sessions. Meanwhile, several pitchers (the youngsters and incumbents alike) are looking to perform their best to make the Opening Day roster, and everyone also wants to take an extended look at Josh Bell, plus Miguel Tejada at third. Don't know if you all got to see today's USA Today website, but there's a fascinating article about the Mitchell Report. Writers Bob Nightengale, Jorge Ortiz and Paul White all contribute to the article and were able to get five current players to speak about their inclusion in the report. Amazingly, there are only ten players who were in the report itself currently on MLB rosters. The players included were reliever Eric Gagne, catcher Gregg Zaun, designated hitter Jack Cust, pitcher Matt Herges, and shortstop Miguel Tejada. All the players seem to be regretful for ever being on the list or ever partaking drug use, although it's varied depending who was asked. However, it's a little eye opening how candid each person got in their answers, but in the end, they all knew the game was sullied and in a way glad it's been cleaned up to an extent. As we head into the start of the season, ESPN's Buster Olney took a look at the early part of the schedule for every team in the American League. Well, guess who has the toughest start to the season -- yes, that's right: The Baltimore Orioles. Home/away: They are home for 15 of their first 35 games. Games against teams that finished over .500 in 2009: 28 of the first 35. No kidding. Meat-grinder stuff: From April 23 to May 5, the Orioles play four consecutive series -- 12 straight games -- against the Red Sox and Yankees. This is not good at all. I looked at the schedule earlier, and I didn't realize how tough things would really by in the first six or seven weeks. Then again, the first 35 games alone for Baltimore could really make or break their season.